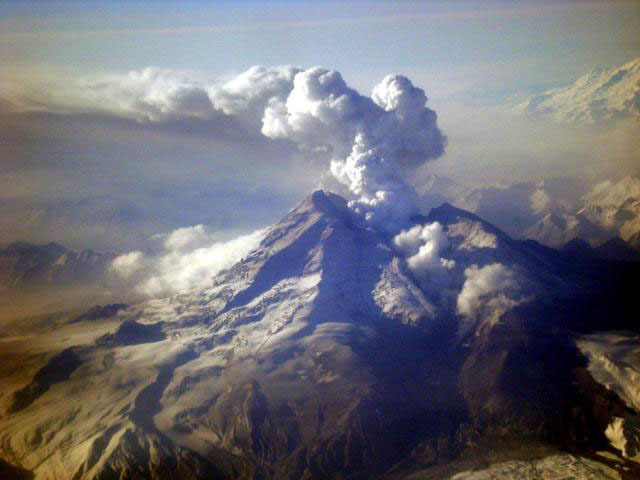 GPS data were used to detect volcanic plumes from eruptions of Mount Redoubt in Alaska. Unlike past research, this study relied on the signal strength, or signal to noise ratio (SNR), data. The new method is powerful because simple models can be used to quickly model SNR data and the SNR data are not sensitive to water vapor. Given that the data is not sensitive to water vapor, has the unique advantage of eliminating any confusion between volcanic plumes and clouds. GPS signal strength data can therefore help to understand volcanic eruptions and to alleviate the aviation hazards of volcanic plumes. GPS receivers are routinely placed around active volcanoes to detect surface motion related to eruptions and other changes in volcano dynamics. 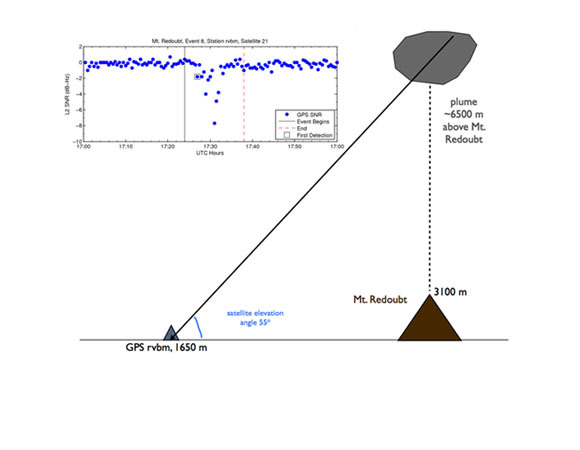 A few studies have shown that standard geodetic techniques can be applied to detect volcanic plumes as atmospheric effects that alter the GPS carrier phase data. Now a simpler approach, using the GPS signal strength data (i.e., the signal to noise ratio), has been shown to be sensitive to large ash particles from volcanic plumes but not as sensitive to water vapor from clouds. 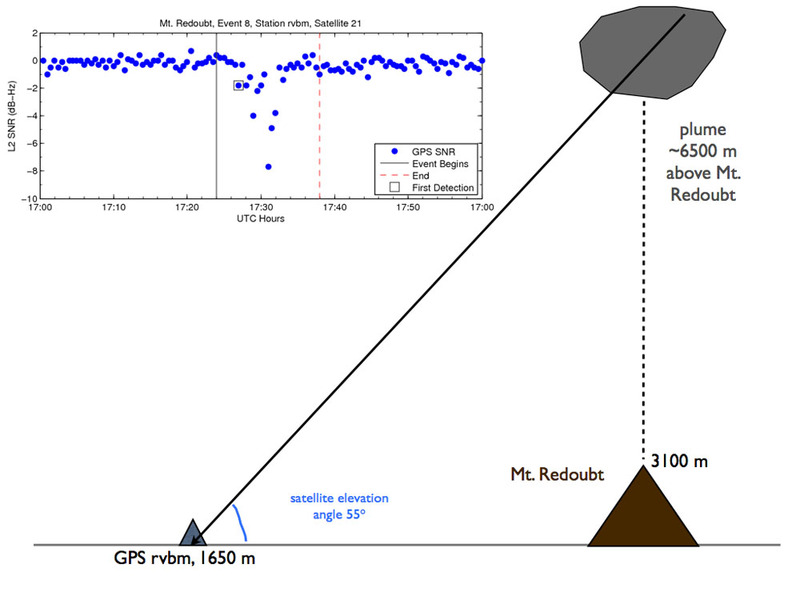 GPS signal strength data was used to detect volcanic plumes from four eruptions of Mount Redoubt, Alaska in 2009. For all of the detected plumes, the GPS receivers were located in an optimal geometry, that is, the signal intersected the ash plume on the pathway from the satellite to the ground-based receiver. Signal strength data collected by ground-based GPS receivers near volcanoes and at appropriate geometries can detect volcanic ash plumes and distinguish the plumes from water vapor clouds. The technique was used to detect several ash plumes from eruptions of Mount Redoubt in Alaska. The ingenious analysis of GPS “noise” is relatively quick and easy, making it a useful option for discerning aviation hazards and reducing risks. With additional work the method may be able to determine the density of the ash in the plume and thus provide even better guidance for aviation avoidance, local risk assessments and a better understanding of volcano dynamics. K.M. Larson acknowledges the efforts of the Alaska Volcano Observatory, Jeff Freymueller and Ronni Garpenthin in collecting the data used in this study.